Fenny & I were at the UE Boom Dinner party last Thursday held at Commune Cafe & Bistro. Look at the white object we are holding ! Interesting cafe x furniture store located at Parco, Millenia Walk. I thought we were at the wrong place at first. Ever since I was introduced to the Logitech Ulitmate Ears, I was wow-ed by their sound performance and during a presentation at the party, I realised that more than 70% of the touring artistes chose the Logitech UE range as their hearing system. Pretty excited to meet the UE Boom huh. 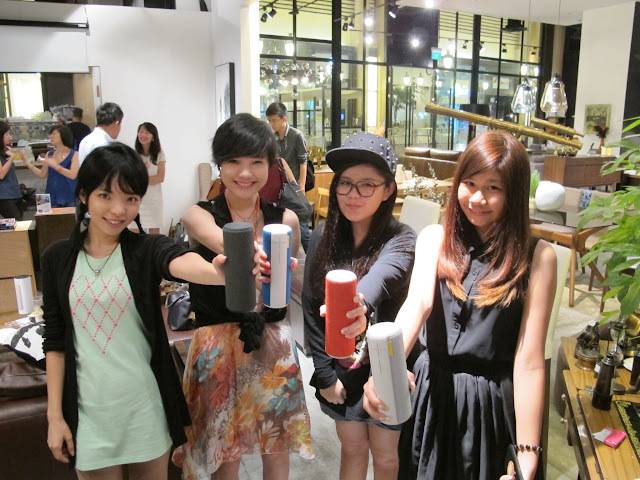 During the dinner party, we were introduced the UE BOOM ; World's First Social music player. It is the first to offer a 360 degree sound in a 15 hour rechargeable battery operated device. Design inspired by a water tumbler, it is easy to grab (and go) and space saving. Weighing not more than 600 grams, the device is also good for doing some arm exercises for the ladies ! Wrapped in a specially developed acoustic skin, I felt that the device is built to live like a human. The Acoustic skin, made from a special woven material used only by Logitech Ultimate Ears , is water and stain resistant. The device is also prone from accidentally falls and child friendly. Available in 4 colors, the device can be connected via Bluetooth, wireless connected via the UE Boom App or through the 3.5mm audio output. Using the UE Boom App, users can connect up to 2 UE Booms and play them in either stereo-to-stereo mode or traditional left right stereo mode. That's all for now, I cant wait to review the UE Boom in my own comfort ! Meanwhile, you can grab the UE Boom at all major consumer electronic outlets in Singapore retailing at $299. Thank you Logitech & Commune Cafe for having us, not forgetting the lovely PRs too !